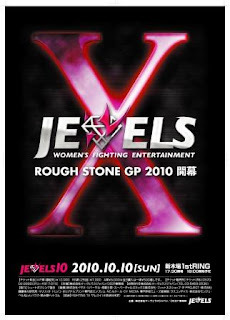 After the July 31 JEWELS show, matchmaker Shigeru Saeki announced that the semi finals of the JEWELS GP Lightweight tournament would be on the Oct. 10 Shin-kiba 1st Ring show and the final would be on the Dec. 17 Korakuen Hall show. Unfortunately Korean Ham Seo Hee has been signed for a couple of kickboxing matches against pro wrestlers for GALDIATOR. This conflicts with the Oct. 10 JEWELS show. Ham has been released and will not be continuing in the tournament. So on Oct. 10, Saori Ishioka will face Celine and the winner will go on to take the fourth spot in the semi finals. The draw for the matches will be held on Dec. 4 and the semi finals and final will be on the Dec. 17 show. After losing on the last show, Ishioka said she was going home to her family in Yokohama to figure out if she wanted to continue in MMA. She returned to Tokyo a couple of weeks ago and now she's ready to go. Most of the rest of the show will have the three ROUGH STONE tournaments and obviously we don't know who the fighters are yet. There will also be a 52kg one day grappling tournament with Ayaka Hamazaki, Amiba, Asami Kodera and Emi Tomimatsu. Tomimatsu is a former pro wrestler with JD. She turned to MMA a few years ago and is planning a return. She works at the JEWELS dojo. Also Sakura Nomura will be in a Shoot Boxing match against NJKF kickboxer Arica. So a big change of plans for JEWELS.